← Kanawha County woman urges support of miners. 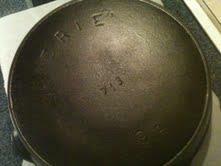 Quality cast iron can last over one-hundred years, or more! Properly cared for it is stick resistant, stove top and oven safe, does not flake, does not contain polytetrafluoroethylene (PTFE) or perfluorooctanoic acid (PFOA), chemicals that may concern some people. I was looking at my posts and came across this draft. It’s pretty old but still useful. I spent a lot of time gathering up old cast iron cookware and refurbishing it. My preferred method? The oven. Wash and dry your cast iron. I am not afraid to wash with dish detergent. I am not soaking the pans, just washing them out. A well seasoned pan can handle a little dish detergent. Clean your cast iron in the oven. Start with a cold oven. Have a fire extinguisher close just in case. Arrange your pans on the oven rack. You can use as many racks as you need as long as there is room for air circulation between the pans. For electric ovens use the self-clean cycle. For gas ovens you’ll need the highest setting possible if there is no self-clean option. 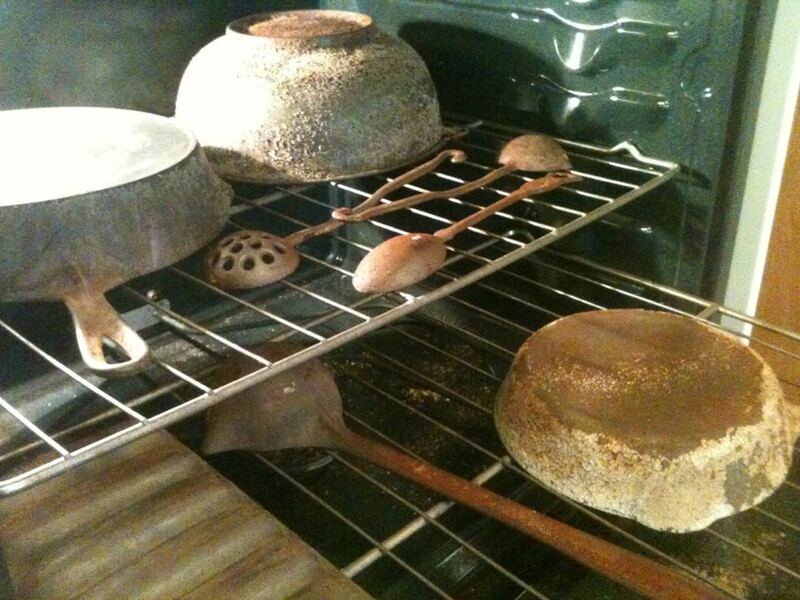 Turn on your stove top vent then wait for the cycle to complete or for all the buildup to turn to ash (see images). 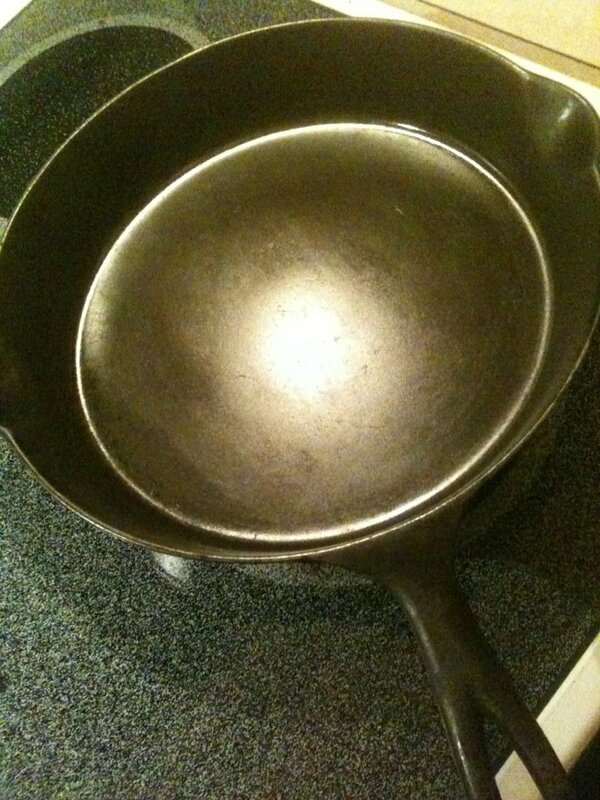 A pan that has heavy buildup may smoke, and stink! The heat will bake off any buildup and leave you with raw cast iron. Allow the oven to cool naturally. DO NOT OPEN THE OVEN to speed the process of cooling. Your cast iron will crack or warp if it is cooled too fast. The heat will bake off any buildup and leave you with raw cast iron. Once cooled, remove all ash with a towel and give a quick rinse. Warm the pan on the stove and rub with Crisco shortening. Warming dries the pan and allows the Crisco to collect in the pores. A fresh start for a neglected piece of history! I cook with olive oil, but after a wash I reseason my pans with Crisco. Regular use keeps them nearly non-stick. I make scrambled eggs in my small skillet several times a week and rarely have a sticking issue. 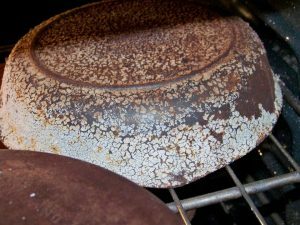 If it’s just rust you need to remove, soak the pan in a solution of 1 part white vinegar to 2 parts hot water, for about 30 minutes. Then use a 0000 steel wool pad, or one of the new synthetic scrubbing pads to remove the rust. You are not trying to polish, just get the rust off. Towel dry, heat, and re-season. You may find a surprise under all the gunk! I have more photos here.